One idea of Wilcox's that I have found useful is that you do not have to worry about shortage of liberties of a group that has at least five liberties. It is not something that I had used as a guide, but now when a group has only four liberties I check the tactical situation. 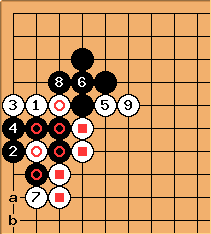 Recently I watched a game in which a Japanese 6 dan made a mistake by reducing his own liberties to four by answering a ko threat. A neighboring group was loosely connected to the one with four liberties, and that group had only two liberties. By throwing in a stone, his opponent made the connection cost two liberties to the first group, yielding a combined group with only two liberties. Then came the devastating atari. Wilcox's dictum (EZGO) that a group with five liberties is safe from shortage of liberties is therefore wrong. For instance, by adding another loosely connected group to the example above the danger comes when the first group has six liberties. But the converse is true. Any group with fewer than five liberties should be checked for shortage of liberties, as a matter of course, and one should be wary of reducing one's liberties to four. A strong tactician has no need for such advice, but it can help the rest of us avoid blunders. SnotNose: I find it interesting (though obvious) that a single stone in the middle of the board away from all other stones has four liberties--one shy of the minimum under this guidance. A separate interesting (yet still obvious) connection is to relate this guidance about 5 liberties to the concept of "adding stones before sacrificing." That is, it is often advantageous to increase the liberties of your sacrifice stones so as to create more forcing moves as your opponent surrounds them. In this sense, one is adding liberties to increase the tactical value of the group, even if it is only to be sacrificed. It is fairly typical to add one more stone before sacrificing, often increasing liberties from 1 (a sacrifice group in atari) to 3 (by playing out of atari). Sometimes yet another stone is added, increasing liberties from 2 to 4. Still, the group to be sacrificed is staying below the minimum for tactical stability. Perhaps it can never get enough liberties, which is why it must be sacrificed. Diagram illustrating what I've just said. Suppose White chooses to sacrifice stones so as to build up the stones. The stone on the second line has one liberty and White cannot increase the number of liberties of this stone (assuming Black always replies). The stone on the third line has two liberties, which is enough for White to get in a forcing move at a. But by increasing this stone's liberties and decreasing those of the stones, White can do better. increases liberties from two to three in sente. temporarily increases liberties to four. Then decreases them down to three again, but this also removes a liberty from Black's group. 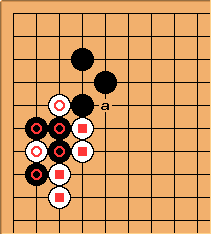 Now that the white group has three liberties, White can get two more forcing moves in sente. Namely, White can make the / and / exchanges. Since a and b are both sente (the latter threatening a ko), White holds both in reserve for later. helps White's shape.